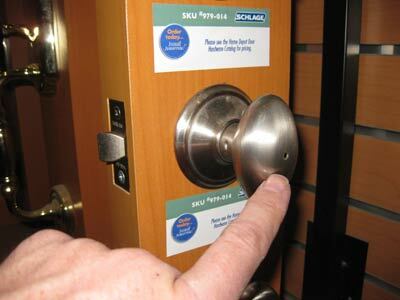 Most lockable bathroom and bedroom doors have an emergency unlocking mechanism built in. I know of five types. The unlocking technique differs with how the door is locked. 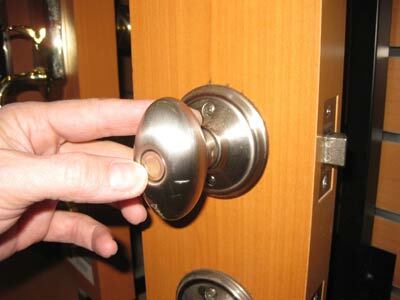 If the door is locked with a pushbutton on the doorknob, it can be unlocked with a pin or rod inserted into the hole in the connected doorknob. 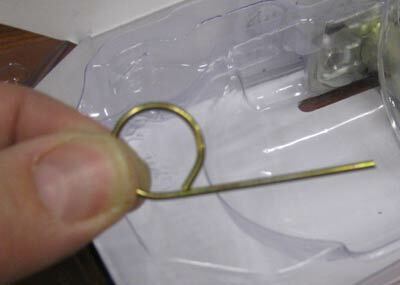 I usually use a long, thin nail from the garage, but I've also used a paper clip, a straw from a juice box and the straightened hook from a wire hanger. I think you could also do it with the ink tube from inside a Bic pen or a dry piece of spaghetti. The nail I chose from the garage was too thick. 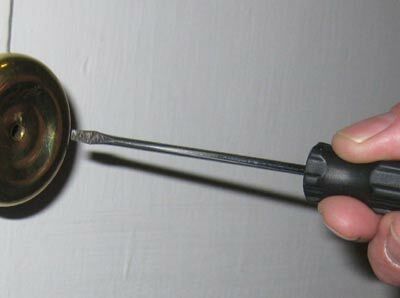 Sometimes an unlocking tool like this comes with a new doorknob, but as you can see, there is nothing special about it. Whatever tool you use, your goal is to poke a hidden button inside the knob. 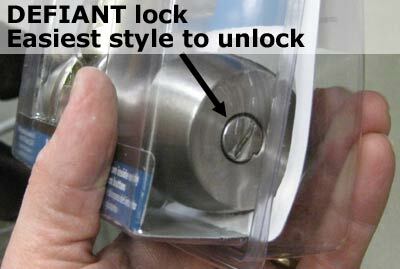 The button pushes a metal rod or lance and pops open the lock. 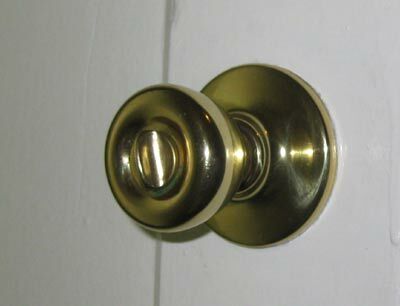 There is no need to twist the doorknob as you poke. You should hear it click open. 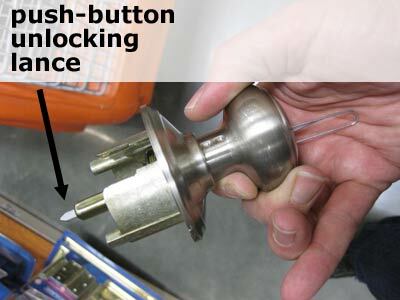 If the door uses a turning tab (or "turning button") for locking, it can be unlocked using a tiny flathead screwdriver. 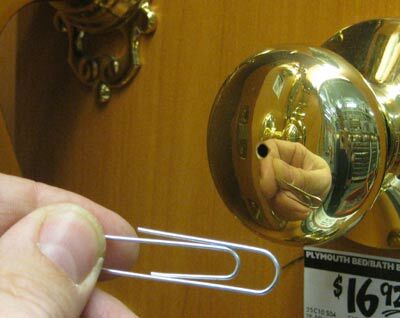 There aren't many substitutes for a tiny flathead screwdriver, so if you don't have one, you may have to borrow or buy one to unlock a door like this. Also, the round keyhole may be just a hair too small for your particular screwdriver to fit, so I almost always end up wriggling and pushing it in. Inside the knob, you won't be able to see what is happening, but aim for a slotted spot in the center of the knob. Use two hands for more control. The position of the flat blade on the screwdriver doesn't correspond to the position of the locking tab. 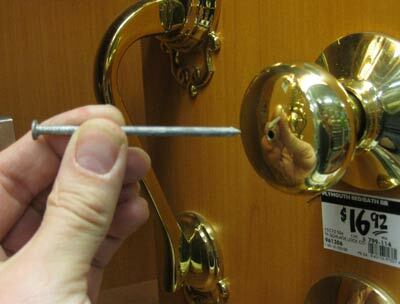 When you feel your screwdriver resting in the inside slot, give it a quarter-turn clockwise. 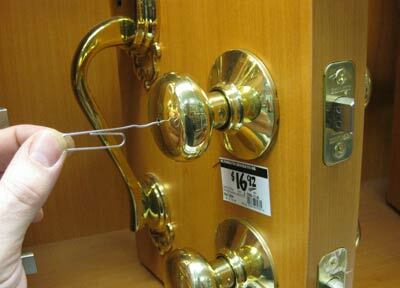 This should turn the locking tab too, unlocking the door. Don't worry about messing up the door or the lock. It isn't brain surgery. Just poke around and turn it until you get the door open. In the photos to the right, take note of where my thumb starts and ends. 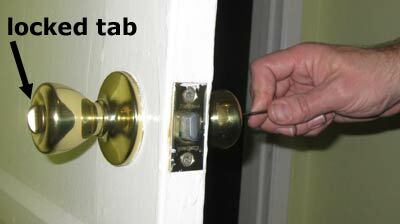 With these turning tab locks, you can also quietly lock the door from the outside, which is a cruel prank when both of Don's thumbs are broken. There are a few other "privacy locks" which are built to be opened easily from the outside in an emergency, but almost all of them are unlocked with either a flat screwdriver or a metal pin. 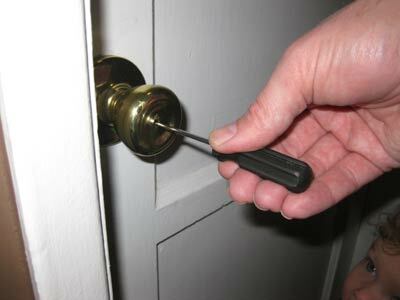 If you are in a new house, I suggest a little practice before you actually have to unlock a door from the outside. Nothing ruins a party faster than an inaccessable toilet.